We could have a really long, drawn out discussion debating whether life imitates art or if art imitates life. Honestly, I only have a very surface-level understanding of those concepts—or what I think they mean, at least. That being said, I believe tonight’s episode leans on the idea of art imitating life. A lot of times when different artistic mediums tackle real-life hot topic issues, they can leave the audience split because it can feel contrived or somewhat cheesy. Let’s face it… Arrow took a chance tonight by incorporating the hotly debated gun control topic and mass shootings in our country. Truth is, the older I get, the more I tend to question using material like this in a show like Arrow. Part of me thinks it might not be the right platform, while another part of me recognizes that things like this are unfortunately a part of the world we live in today—so maybe we have to show them. So, I’m kind of split. That being said, I did enjoy the episode overall. I thought a lot worked well, even though I found Rene’s backstory to be a bit cliché. What really worked (and something I liked a lot) was that the episode was a completely contained story. To me, it was the equivalent of a really good filler issue (yes, they’re rare, but they exist) or one-shot in the comic book world. It was nice to see a beginning, middle and an end. Not only that, but to see the good guys come out on top. To start things off, the episode was broken down into a relatively simple format: bad guy does bad thing, good guys have to rally to figure out what to do, good guy(s) face internal/moral dilemma, bad guy gets caught in the end. Sometimes the less-is-more approach just works and I feel tonight was a good example of that. It was also nice to break things up a bit and see an episode that lives completely in the present and didn’t rely heavily on Russian flashbacks. I think we were also introduced to an interesting side of Oliver. Truth be told, this may have been my favorite episode from an Ollie standpoint. That’s right: Oliver, not the Green Arrow. I loved that we saw him faced with an issue he would have to deal with as a public figure and not the beat-’em-up, hooded vigilante with the gruff voice. No. He was vulnerable in his role as mayor and completely at a loss for how to handle the situation—as evident by his press conference. His self-doubt over his ability to deal with the problem made it all the better when Quentin reinforced that it would need to be Oliver who handles the situation, not the Green Arrow—regardless of how many tries it takes him to get it right. Speaking of which, for a character I’ve always seen as just “sort of there” and not bringing a whole lot to the table, Quentin really stepped up with the timely motivating words for Oliver! I also thought the writers’ decision to have Oliver question the notion that using violence to combat violence isn’t always the way was a pretty interesting angle. 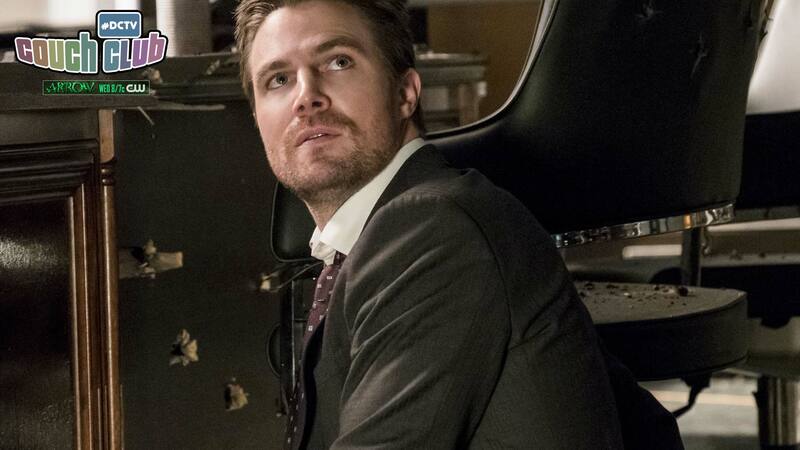 It's also part of a growing theme we've seen this season with Oliver questioning his past and present decisions. The fact that he was struggling with this idea that maybe his (and the team’s) actions have sparked or incited others to act out violently is a theme I hope they continue to explore. To me, the most interesting characters are the cerebral ones—the guys and gals who question their actions and/or decisions and think about the potential reactions or outcomes. Because it shows they’re human. Speaking of being human. I thought Oliver’s speech at the end was possibly his best moment this entire season. There is an older Batman issue where Bruce is talking to a young Tim Drake who is aspiring to become the next Robin, but isn’t quite there yet. A fantastic page shows Bruce explaining that when you put on the mask and the suit, you become larger than life—a symbol. You have to live up to what you’ve made yourself out to be. The mask protects you and hides you from your fear. But when there’s no suit or mask, you can’t hide from yourself. Although Bruce is alluding to something a little different, there’s a piece you can take a way and align with what Oliver did tonight. He faced himself and overcame his fear and self-doubt in order to step up and be the man the city needed. Arguments can be made for both sides, but sometimes the pen is mightier than the sword and I think that’s pretty cool. While this episode obviously took on the issue of gun control and gun-related violence, I think it also demonstrated the importance of open discussion (Oliver and the councilwoman) and being able to disagree with someone but be open to hearing their viewpoint (Curtis and Rene)—concepts that seem to have been lost in the noise of modern times. But that’s for a different kind of column. Looks like the ski goggle-wearing menace Vigilante, will be coming back…what do you guys think?